Welcome to the world of overclocking, a place where dreams are realized and where having just enough of those overclocking chops may mean the difference between a world record-breaking benchmark or some time crying into a pile of burnt-out processors and GPUs. Overclocking the best graphics card isn’t for the faint of heart. If you rush through it, and don’t treat your GPU with the respect it deserves, you can do some major damage to your hardware. However, if you’re interested in pushing your hardware to its limits, in order to get the absolute most bang for your buck, this is a great hobby to have. 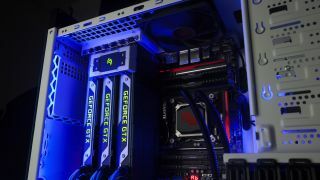 With both DirectX 11 and DirectX 12, the GPU is the most important component for sheer performance, so overclocking your graphics card is something that could really benefit you if you’re a gamer. Times have changed since the days of simply pushing a button in Nvidia GPU Boost or AMD Power Tune, but you can still radically increase your card’s clock speed by using some third-party software. That being said, if you’re not comfortable adjusting sliders little by little, then benchmarking and then doing it all again, you may be better served by letting the proprietary software do its own thing. Modern GPUs will overclock themselves when they sense they have the thermal headroom to do so. So, if this all sounds appealing, sit back, relax and we’ll show you exactly how far you can push a graphics card in 2018.